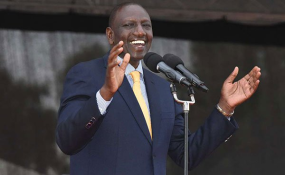 The National Police Service has responded to claims Deputy President William Ruto that investigations on corruption should be left to the Ethics and Anti-Corruption Commission (EACC). Dr Ruto had on Sunday claimed that the Director of Criminal Investigation George Kinoti is being used to scandalise politicians and undermine mega Jubilee projects under the guise of fighting corruption. DP's allies told Mr Kinoti to focus on fighting robberies and petty crimes and leave the war on corruption to EACC. In response, the Police Service fired a tweet on Monday afternoon that quoted the National Police Service Act 2011 on the functions of the Directorate of Criminal Investigations. The roles of the DCI include among others undertaking investigations on serious crimes including homicide, narcotic crimes, trafficking, money laundering, terrorism, economic crimes, piracy, organized crime and cyber-crime. Functions of the Directorate of Criminal Investigations. "I want to be clear that we fully support the fight against corruption. But we will resist and reject any attempts to weave political narratives and propaganda into the projects in the name of fighting graft," the DP had said at a church function in Limuru. The DCI is the second senior investigative authority to respond to Dr Ruto's claims. Director of Public Prosecutions Noordin Haji was forced to profile corruption cases by tribe as he sought to counter allegations that the fight against corruption was targeting specific tribes.